A clean room’s design and equipment affect its performance. Properties like structural design, air filter and vent position, air filter and vent composition, and all other properties related to a clean room’s configuration affect decontamination capacity. The higher the decontamination standard, the more vigorously controlled each of a clean room’s properties must be. Portable and modular clean rooms, for example, are generally not capable of generating the extremely low decontamination levels that are possible in permanent clean rooms. For this reason, they are less likely to employ light-scattering particle measurement equipment or any of the other kinds of advanced equipment installed in more advanced clean rooms. But as the decontamination standard of a clean room rises, the impact that all clean room supplies have on performance also increases. Infectious disease research laboratories, which require highly controlled testing environments, make use of harsh sterilization chemicals. Work surfaces in those environments must be corrosion-resistant so as not to contaminate test samples with vapors or particulates generated by corrosion. Stainless steel, for example, can corrode if exposed to bleach. Clean room supplies must be selected carefully because of the strictness of the standards set for clean room operation. The United States government, the ISO and other international standard-setting organizations assign ratings and classes to clean rooms depending on their capacity for decontamination. US FED STD 209E standards rate clean rooms based on how many 0.5 micrometer-sized particles per cubic foot are considered acceptable within a given clean room. Class 1 clean rooms contain no more than one 0.5 micrometer-sized particle per cubic foot. 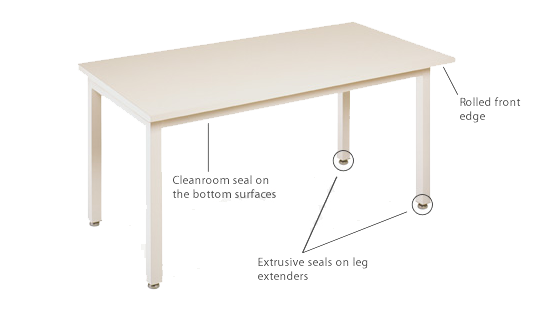 This is an extremely low contamination level, and in order to achieve it, no fibrous building materials, furniture, or clean room clothing can be brought into the enclosure. Even certain kinds of paper cannot be brought into Class 1 clean rooms because of some paper varieties’ fibrous qualities. Some clean rooms are equipped with adhesive mats designed to pick up particles on the floor that may have been tracked in by workers. Such advanced clean rooms employ complex combinations of filters, monitoring equipment, and other methods of keeping contamination low, but every factor contributes to the capacity of a clean room to become decontaminated. >Cleanroom Supplies Clean room supplies are all of the equipment, components, and constituent parts that make up clean room systems. Air filters, sterilization chemicals, and application tools, fans, vents, work surfaces, building materials, and all other components related to the structural and functional properties of clean rooms fall under the category of clean room supplies.